Ladakh Expert – Page 4 – Foremost resource for traveling to Leh-Ladakh. 2017 is likely going to prove quite challenging to BRO, tasked with reopening of the crucial Manali – Leh Highway. This is due to record amount of snowfall occurring in Himachal and Ladakh, which has led to higher than normal snow accumulation on the highway. However, all this depends on the weather remaining favorable and due to the risks involved in clearing the highway under several feet of snow, BRO is in constant touch with Snow and Avalanche Study Establishment (SASE). If there is high chance of avalanche or snowfall, then BRO is likely to delay its operations. Because avalanches and heavy snowfall can not only cover the already cleared road and block it, it can also lead to casualties of BRO workers and officials involved in the clearing operations. Despite of heavy snowfall, BRO has managed to keep most of Lahaul Valley connected internally by road and is now planning to reconnect Udaipur with rest of Lahaul. For this purpose they have even flown in their personnel to Udaipur and Stingri. Rahni Nullah, Beas Nullah, Chumbak Mor, Rakshi Dhank and the road leading to Baralacha La will prove the most challenging to BRO. And while Rohtang Pass is expected to reopen comparatively early, reopening of the highway till Leh will take longer, thanks to higher snow accumulation at Baralacha La pass. Since 25th of January, Ladakh is digitally disconnected from rest of India, due to a fault with BSNL Optical Fiber Cable near Zoji La. With some of the heaviest snowfall seen in Ladakh and Kashmir in recent years, Drass has been cut off from Kargil. And while the army team has confirmed technical issue with OFC at Shaitan Nallah near Zoji La. BSNL’s team from Kargil is unable to travel to Drass, in order to further investigate the issue. Broadband, WiMAX, WLL, mobile, STD/ISD and even army telecommunication has been affected due to this OFC fault. As per the BSNL TDM, Phunchok Dorjay, if there is any technical fault, it will be restored within 2-3 days, once BSNL technical team is able to travel to Drass. However, if there is a major damage to the cables, then it can only be repaired, once the road is clear. We hope, it isn’t a major fault with the OFC and it can be repaired within the next few days. Otherwise, Ladakh will continue to remain cut off both digitally and by land from rest of India for the next couple of months or more! For travelers visiting Ladakh in the upcoming days, it is best to inform your loved ones in advance, that it would be difficult to call them during your trip, so that they do not worry unnecessarily. And for the sake of travelers and locals alike, we really hope BSNL and other private operators lay OFC through Manali as well, in order to provide some redundancy to their network. During my September 2016 trip to Ladakh, I stayed at Pangong Villa, which is located in Spangmik Village near Pangong Tso. 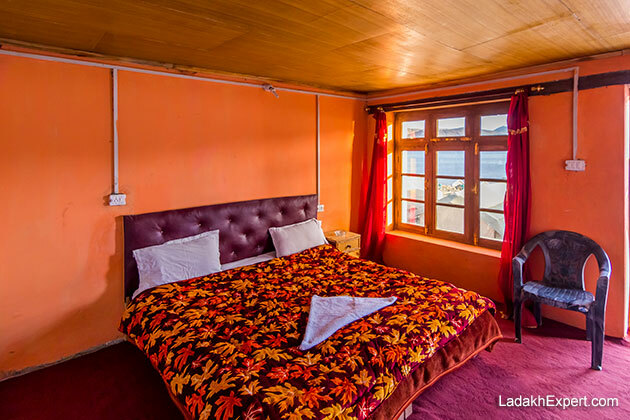 Real benefit of Pangong Villa is that it is one of the last hotels, located towards the end of Spangmik Village. So early in the morning, this is the view that awaits you from your room. In fact view from the room was so good; I had shot 3 time-lapses from right outside my room. 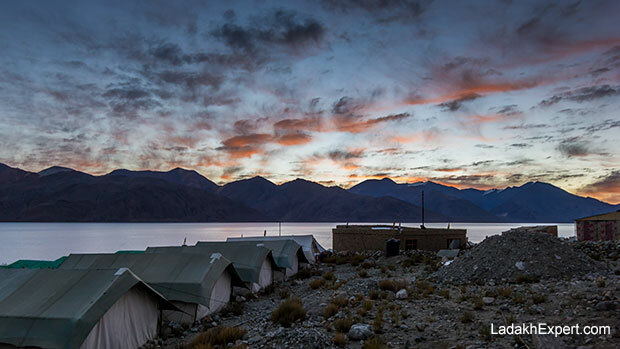 In the freezing September winds of Ladakh, the value of being able to setup a time-lapse and run back into the comfort of room is something that is unparalleled. 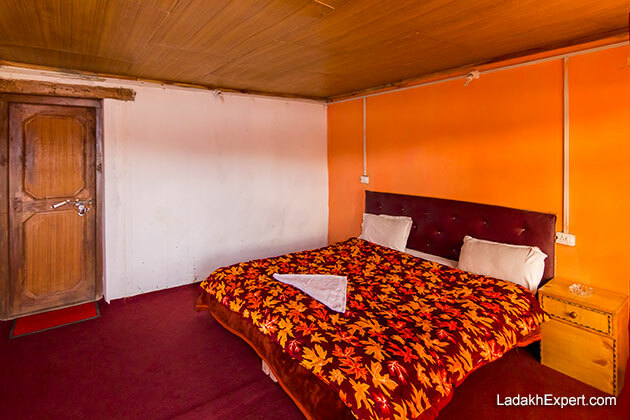 Rooms are fairly cozy as well, well as cozy as they can get in freezing temperature of Ladakh. 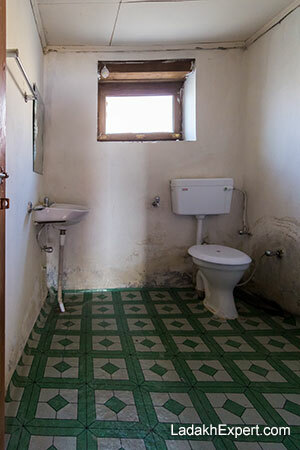 Thanks to traditional construction, rooms are warmer than the concrete guesthouses. However, heater isn’t available. Since a generator is used to provide electricity in evening. Rooms are available on MAP plan i.e. cost of dinner and breakfast is included in the price. Buffet dinner is served in the dining room near the rooms. And you can ask Dorjey to pack your breakfast, in case you plan on leaving early in the morning. In fact Dorjey was kind enough to get us warm water and tea around 6am. Mobile phone network (BSNL) only comes at a certain point in the dining room, though this is the case with most of Spangmik, since proper mobile phone network is only in Lukung. In 2016, tariff was Rs. 2,500 per night on MAP plan, and you can bargain a bit with Dorjay for discount. Overall a good and cozy place to stay at Spangmik, if you want proper room with attached toilet, without breaking the bank. For bookings, contact Dorjey +91-9419342720, 9622960460. Ladakh is home to several ancient Buddhist Monasteries, each with their own legends and certain traditions. And nowhere are these legends and traditions more apparent than at the annual festivals these monasteries hold each year. 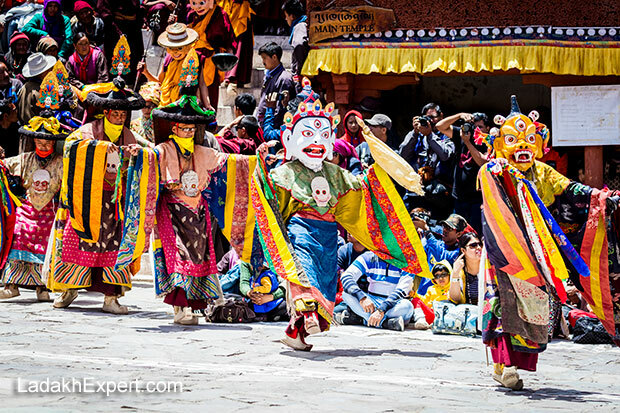 These colourful and enchanting festivals give you an insight into the ancient history and traditions of Ladakh, something that is becoming less and less apparent in ever modernizing society of Ladakh. Here is the calendar of festivals which will be held at various monasteries in Ladakh and Zanskar this year. BRO on Thursday began their snow clearing operation on Srinagar – Leh Highway, which has been delayed by over couple of weeks this year due to heavy snowfall. However, BRO is planning to clear the snow from this crucial highway to Ladakh by end-May and reopen the route for vehicular traffic by June 2015. While two teams have started working from either side of Rohtang Pass to carve out a road through 30ft of snow, other teams from BRO are expected to soon start their work on clearing Baralacha La and Tanglang La, which too are buried under heavy snow. While Rohtang Pass is expected to reopen by May and would provide much needed relief to the residents of Lahaul and Pangi Valleys, the major stumbling block for BRO would be Baralacha La, which receives heavier snowfall than Rohtang Pass and is more difficult to clear. We will keep posting regular updates on the condition and status of Manali – Leh Highway, so make sure to subscribe to our free email updates to get receive latest information on Ladakh.